ones can visit. We don’t challenge demonic activity and the only way to remove it is through the faith in Jesus. 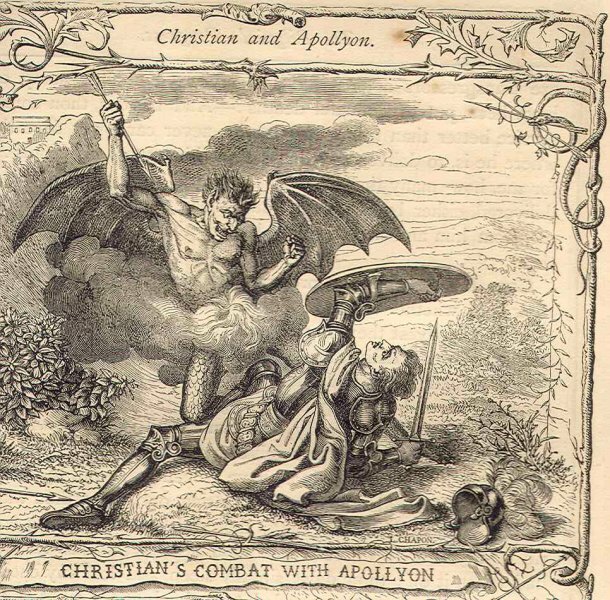 Apollyon (top) battling Christian in John Bunyan’s The Pilgrim’s Progress. From Christianity and Judaism, Angel of death, destruction, and the netherworld. The name Abaddon is derived from the Hebrew term for “to destroy” and means “place of destruction.” Apollyon is the Greek name. In MAGIC Abaddon is often equated with SATAN and SAMAEL. His name is evoked in conjuring spells for mali- cious deeds. 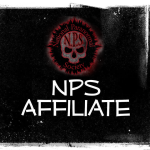 Abaddon is the prince who rules the seventh hierarchy of DEMONs, the ERINYES, or Furies, who govern powers of evil, discord, war, and devastation. Originally, Abaddon was a place and not an angel or being. In rabbinic writings and the Old Testament, Abad- don is primarily a place of destruction and a name for one of the regions of Gehenna (see HELL). The term occurs six times in the Old Testament. In Proverbs 15:11 and 27:20, it is named with Sheol as a region of the underworld. In Psalm 88:11, Abaddon is associated with the grave and the underworld. In Job 26:6, Abaddon is associated with Sheol. Later, Job 28:22 names Abaddon and Death together, implying personified beings. In REVELATION 9:10, Abaddon is personified as the king of the abyss, the bottomless pit of hell. 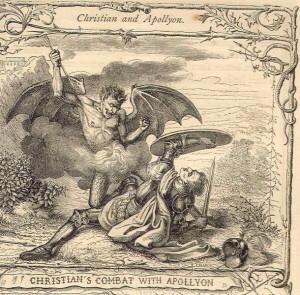 Revelation also cites the Greek version of the name, Apollyon, prob- ably a reference to Apollo, Greek god of pestilence and destruction. Horst, eds. Dictionary of Deities and Demons in the Bible. 2nd ed. Grand Rapids, Mich.: William B. Eerdmans, 1999. FALLEN ANGEL and the seventh of the 72 SPIRITS OF SOLOMON. In HELL, Amon is a strong and powerful marquis. 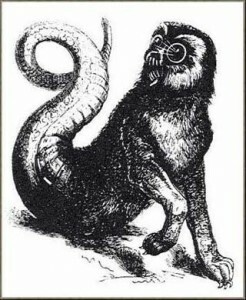 He appears first as a wolf, but on a magician’s command, he will take on the shape of a man with a raven’s head and dog’s teeth. He accurately tells about the past and the future. He makes men and women fall in love with each other, and he settles disputes between friends and enemies. He rules over 40 LEGIONs of DEMONs.